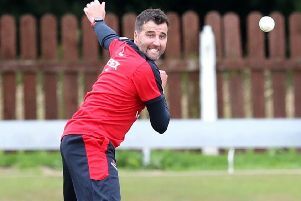 Waringstown captain Greg Thompson praised the opening partnership of Adam Dennison and James Hall after their stand of 134 from 15 overs helped seal the All Ireland Twenty20 Cup on Saturday. After winning a semi-final bowl-out against Brigade earlier in the day, the Villager’s beat Clontarf by seven runs on DLS in a rain-affected final. Batting first, Waringstown reached 122-0 from 14 overs before the rain arrived again at Bready, and the match was then reduced to a 15 over game. Dennison and Hall added another 12 in the one over after the break, and with DLS calculations, it left Clontarf requiring 154 from their 15 over allocation. Both men have surpassed 1000 runs for the season, and ended on 61* and 66* respectively. James McCollum struck early to get rid of former Waringstown professional Obus Pienaar for 7 before Shaheen Khan picked up two wickets to leave Clontarf 41-3 after five overs. Bill Coghlin was the shining light for the Dubliners, and raced to 38* from 17 balls, including three fours and three sixes. A catch from Phil Eaglestone off the bowling of Gary Kidd proved to be the turning point as the rain arrived soon after and left Waringstown victorious by the slim margin. They are now reigning champions in six different competitions, and Thompson gave credit to his opening duo who set the platform most weeks to put their side in a winning position. “The two of them have been brilliant,” he said. Thompson also complimented the Clontarf side led by Joe Morrissey for always wanting to get back out to play. “Credit to Bill for batting well and bringing them back into it,” he added. “They lost five wickets at the other end and Bill did his best and it was a catch from Stoopy that has won the game for us. “Credit must also go to Joe. At the first rain break we were sitting in a great position, and some captains would have dug their heels in and said they didn’t want to play cricket. Waringstown will now turn their attention to next weekend’s home Premier League game against leaders CIYMS, before they prepare for the Irish Senior Cup final against Merrion at Stormont on September 1.